Cybercrime, a form of online terrorism, is now threatening the very safety and well-being of our nation’s healthcare system. No hospital, physician, or other healthcare provider is immune to the operational chaos, harrowing events, and potential financial ruin that can result from sudden cybercrime attacks. Safety nets and other safeguards are available to minimize these risks, but many providers do not know how vulnerable their IT systems and networks are until it is too late. 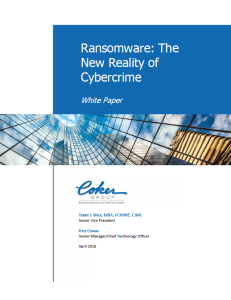 This paper defines today’s most devastating form of cybercrime–ransomware–and outlines concrete methods for mitigating this risk.